Architectural Resource Center's patented square stackable weight system allows you to easily combine different size weights in any combination. Create the perfect counterbalance for any window sash. Our round window weights come in two sizes and diameters. They can be ordered with or without plastic sleeves, which keep the weights aligned when sliding inside the weight pocket and safely encases the lead in plastic. 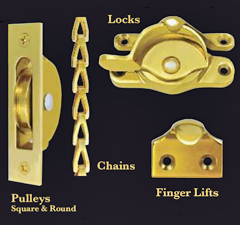 The Architectural Resource Center designs and manufactures the finest traditional window and door hardware available. We are a wholesale house catering to manufacturers, architects, builders and designers. With facilities in both the US and Europe, we supply standard and custom hardware to window manufacturers and architects working on some of the most impressive structures in the world. ARC gives you options you won’t find elsewhere. We don't limit your choices to the same hardware that is available everywhere else. Our customers often ask us to duplicate existing hardware We make sure that we can tailor our solution to your specific needs . After 29 years in this business, we have developed a reputation as the experts when it comes to traditional hardware. We love to share what we know. Ask us how Architectural Resource Center can solve your hardware problem.